Parties that call themselves green usually define as one of their main goals to protect the environment. Using earth’ resouces in an efficient and respectful way, trying to adapt one’s consumption patterns in order to mitigate the dangerous developments of global warming and climate change – all those are usually policies pushed for by green parties. It is particularly important for politicians that their words are followed by appropriate actions – a President claiming to fight corruption should not receive favors by a big government contractor; a governor claiming to protect human rights should not ignore when police in his state uses violence and torture. Yesterday, on a highway outside Mexico City, I came across this car. A Chevrolet Suburban, black, darkened windows, quite popular in Mexico, actually. Depending on the model, the Suburban has at least a 5.3-liter engine and 320 horsepower and a fuel economy of, in the best case, 15 miles per gallon in the city and 21 miles per gallon on the highway (for my European friends: that is roughly 15 liters on 100 km in the city and 10 on the highway). The car displayed huge stickers with the slogan “Partido Verde – Sí cumple“, meaning that the Green Party fulfills the promises they make. 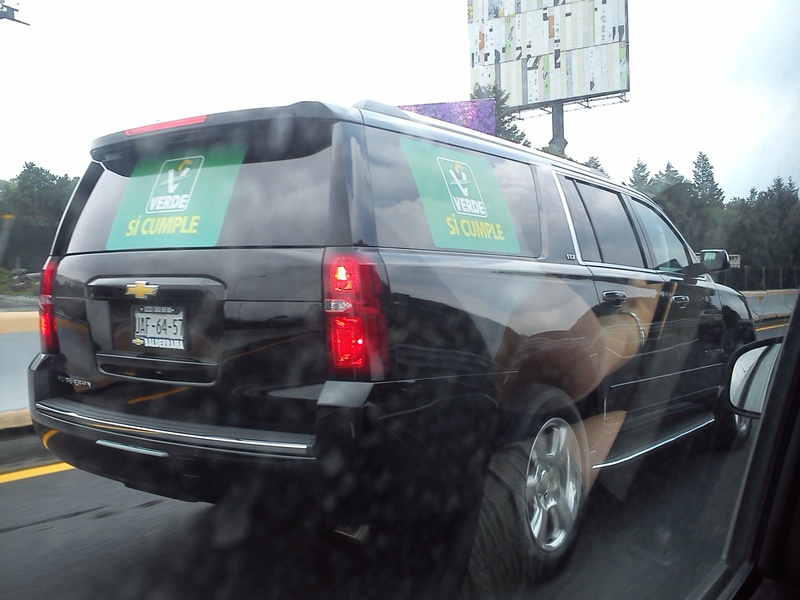 I was wondering what the political promises and goals of Mexico’s Partido Verde were when I got overtaken by that car. I think, the party has some catching up to do on their own environmental consciousness.